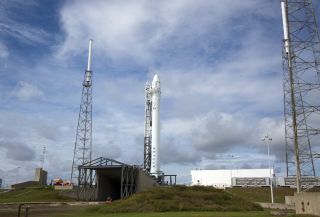 A SpaceX Falcon 9 rocket stands atop its launch pad during preflight preparations to loft a private Dragon space capsule on the first commercial cargo flight to the International Space Station. Liftoff is set for Oct. 7, 2012, at 8:35 p.m. ET from Cape Canaveral Air Force Station, Fla.
An unmanned private spacecraft all set to launch the first commercial delivery to the International Space Station tonight (Oct. 7), marking a major shift in how NASA sends supplies and gear to the orbiting lab. The gumdrop-shaped Dragon space capsule built by the private spaceflight company SpaceX is poised to blast off from a pad at Cape Canaveral Air Force Station in Florida to begin a three-day voyage to the space station. SpaceX raised the Falcon 9 rocket that will boost the Dragon capsule spaceward into launch position this morning. Liftoff is set for 8:35 p.m. EDT (0035 Monday GMT) and the weather forecast looks favorable for launch, NASA officials said. "Tomorrow's SpaceX launch begins a new era for spaceflight and the International Space Station," Sam Scimemi, NASA's space station director, said in a briefing Saturday (Oct. 6). "These flights are critical to the space station's sustainment and to help begin its full utilization." SpaceX's Dragon spacecraft will launch nearly 1,000 pounds (453 kilograms) of cargo for astronauts living on the space station. The crew plans to welcome the spacecraft on Wednesday (Oct. 10) by grappling it with a robotic arm and attaching it to the station. SpaceX is also working to upgrade the Dragon spacecraft and Falcon 9 rockets to launch seven-astronaut crews into orbit. The spacecraft was designed from the start to enable future crewed flights, according to SpaceX's CEO Elon Musk, the billionaire entrepreneur who founded the company in 2002. With NASA's space shuttle fleet retired, the space agency is depending on commercial spacecraft like SpaceX's Dragon capsules to ferry cargo — and eventually astronauts —into and from low-Earth orbit. The agency is outsourcing those services to commercial companies while developing its own new rocket and spacecraft for deep-space exploration. SpaceX is one of two companies with contracts to provide cargo shipments to the space station for NASA. The other firm, the Virginia-based Orbital Sciences Corp., has a $1.9 billion deal for station resupply flights using its new Antares rocket and unmanned Cygnus spacecraft. Of the two companies, only SpaceX's Dragon is capable of returning cargo to Earth for retrieval. "We're very excited. This is the first time we're taking a powered cargo up," SpaceX President Gywnne Shotwell said. "We're quite excited about the missions both up and back." Some notable items making the trip up to the space station: a collection of 23 student experiments; a spare urine pump for a space toilet; and astronaut food, including a special delivery of ice cream for the station's three-person crew. The ice cream will fly up inside a powered freezer along with other items, NASA officials said. "The SpaceX Dragon is really important in bringing research from the station back to Earth," station program scientist Julie Robinson said in a briefing. "It essentially replaces the capacity that we lost when the shuttle retired." The mission take less time to reach the station, too, since SpaceX does not need to repeat some rendezvous tests that prolonged the first flight. "This time we will be driving right to station," Shotwell said. In fact, SpaceX and NASA mission managers plan to return nearly 2,000 pounds (907 kilograms) of science experiment results, equipment and other items back to Earth when the Dragon capsule returns. That's nearly twice the amount of supplies the spacecraft is delivering. "Some of it is for research, and some of it are [orbital replacement units] to be refurbished or repaired," station program manager Mike Suffredini said. Having a U.S.-based cargo ship for the space station has made adding last-minute items, such as replacements for broken parts, much easier, Suffredini added. Until now, NASA has had to ship station cargo not riding on shuttles to its partners in Europe, Japan and Russia to pack aboard those countries' unmanned space trucks. With an American spacecraft, the process is faster and more flexible, he said. "This capability is vital to the International Space Station," Suffredini said. NASA will provide a broadcast of SpaceX's launch to the International Space Station tonight on its NASA TV channel, as well as via a webcast. You can watch the launch live on NASA TV here beginning at 7 p.m. EDT (2300 GMT). The Falcon 9 rocket's ascent may also be visible from the U.S. East Coast, weather permitting. Current weather forecasts predict a 60 percent chance of good conditions for tonight's launch attempt. SpaceX also has two other backup launch windows, on Monday and Tuesday, if needed. The weather on those days is expected to be pristine, with an 80 percent chance of good conditions, mission managers said.